Just back from London, skipped wishing Her Majesty the Queen (am sure she must be devastated but I have just this much time after all!) for the Diamond Jubilee, passed up on dear ol’ Kate & William and spent the entire three days SHOPPING!!!! How could I not, with all the super-gorgeous beauty treats up for grabs in honour of the Queen’s 60 years on the throne? Still unpacking the bags but simply had to show you this ultra-scrumptious gold-plated solid perfume compact from Estee Lauder. 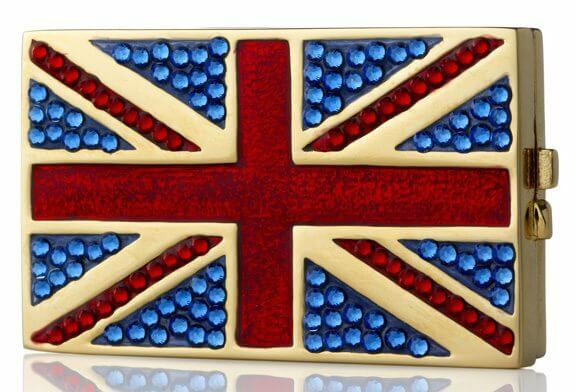 It’s called Jewelled Flag of Britain, has been handcrafted by fine jewellers and decorated with 130 Swarovski Elements. Inside is one of my favourite Estee Lauder perfumes – Beautiful – which unveils a romantic blend of Queen-worthy notes like lily, cassis and tuberose (I have it on good authority that the latter is, in fact, one of Queen Elizabeth’s favourite florals). The cost? £320. Yes, certainly not cheap but it’s really, really gorgeous and how many times does a Royal Jubilee come around anyway? If you want this royal souvenir, head over to Estee Lauder and buy it NOW! This one’s not going to stick around for long. I picked up the second-to-last piece at Harrods on Sunday, so am sure it’s sold out there by now! « India’s jodhpurs: From one Diamond Jubilee to the next! Here’s the chance to get one of the first run copies. I will not be selling it in book stores but it is available on Ebay, Etsy and by direct order from me ([email protected]). Cost is $39.95 plus shipping.